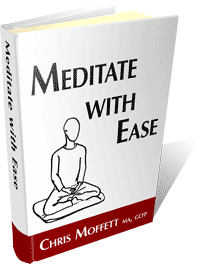 Below you will find the download link for your copy of Meditate With Ease. You’ll want to save it to your computer so you have access anytime. If you don’t have a PDF reader you can download the Adobe Reader here for free. I recommend printing up a copy of your new eBook and placing it in a binder for easy reading and handy reference. Keep it near where you meditate, and revisit it as needed to keep the ideas in it fresh in your awareness.